In addition, for optimal SEO on products with missing titles, I recommend that Admin > SEO > "Page title format" is set to "Product name :: Category name :: Shop name"
Awesome Phil! 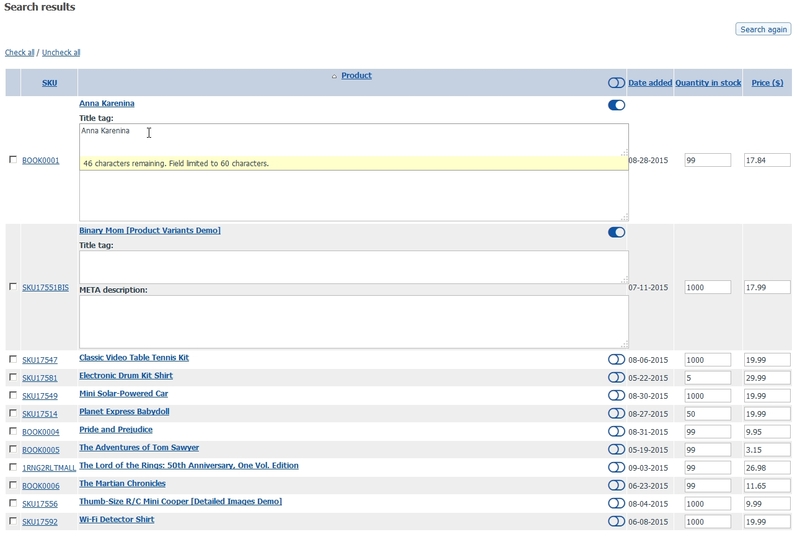 It would be really cool if you were able to add several other fields to also be changed on the product grid. A mega product management mod, if you will. It would be really cool if you were able to add several other fields to also be changed on the product grid. A mega product management mod, if you will. Just something for ideas sake. This is the cart I am moving from. I have the option to add properties to the product grid and change them on the fly without opening the product edit. There are many options with this mod, too many IMO. You also have the option of sorting the headings. It doesn't need to be this extensive. I left out over 1/2 of the attributes possible. Keep in mind the screen shot is from an old version of X-cart but you can get the gist of the functionality. Custom Development, Custom Coding and Pre-built modules for X-cart since 2002! We support X-cart versions 3.x through 5.x! Home of the famous Authorize.net DPM & CIM Modules, Reward Points Module, Point of Sale module, Speed Booster modules and more! Please E-Mail us for questions/support! Is there anyway you could add the ability for custom category descriptions that were individual for each page when you have x products per page and you end up with page 1 / 2 /3. Hope this makes sense. Character limiters now disabled by default. A few subtle changes also.